ORLANDO, Fla. — A massive amount of hit batters took place during the 2014 college baseball season, a good portion on purpose by batters trying to gain an edge. As a result, the NCAA Baseball Rules Committee has cracked down with precise wording in the rule to slow down this tactic. Speaking in front of NCAA Division I, II and III coaches at the Rules Meeting at the American Baseball Coaches Association convention, NCAA National Coordinator of Umpires George Drouches outlined an epidemic that took place last year across NCAA baseball with batters who were purposely hit by pitches. According to the 2014 final NCAA Division I statistics, batters were hit 91 times or more on 23 different teams last season. Incredibly, 10 teams were hit 101 or more times last season. The new rule states that a batter must make an attempt to avoid being hit by the ball. If the umpire rules the batter did not make an attempt to get out of the way, or that he leaned into the path of the ball, a pitch inside the strike zone that touches the batter will be called a strike. If the pitch is outside the strike zone, it will be called a ball. The national team leader in hit by pitches last season was Maryland with 126 hit by pitches. Eleven batters were hit 11 or more times with three being hit 19 or 20 times. According to the final 2014 NCAA Division I statistics, there were 33 players who were hit 20 or more times last season led by Chris Cook of George Mason (31 HBP in 56 games) and Aaron Payne of Oregon (31 HBP in 64 games). As far as NCAA Division II, Lander University batters were hit 130 times in 61 games. In NCAA Division III, Heidelberg was No. 1 with 116 hit batters in 44 games. In junior college baseball, Hutchinson C.C. led NJCAA Division I schools with 134 hit batters in 60 games. This is hardly the first time there has been a problem with batters purposely getting hit by pitches. It has been a problem for well over 30 years as the NCAA Rules Committee has wrestled with this problem when severe flareups of hit batters have taken place. When an all-time record 53 batters were hit in only 15 games during the 2007 College World Series, the NCAA Rules Committee took a tough stance on batters purposely getting hit by pitches. More than half of the 53 hit batters purposely stuck a part of their body in front of pitches. Shortly after the 2007 College World Series, the Rules Committee took a stance that that batters must make an attempt to avoid the pitch to be awarded first base. The wording was changed slightly in subsequent years. But now batters must once again make an attempt to avoid being hit by the ball or they will not be allowed to take first base. The most prolific hit by pitch artist college baseball has ever witnessed, Tyler Crabtree, has worked his tactics the past three years. Last season for NCAA Division II Central Oklahoma University, he was hit a modest 23 times in 44 games. But the year prior, he was hit 41 times in 49 games as the leadoff hitter. This tied the NCAA all divisions record of 41 set by Chris Kline of Lincoln Memorial in 1997. One year earlier, Crabtree was hit 41 times in 49 games at Eastern Oklahoma St. J.C.
Over a 3-year period, Crabtree was hit a staggering 105 times in 142 games. No college baseball player has ever been drilled this many times over three years. 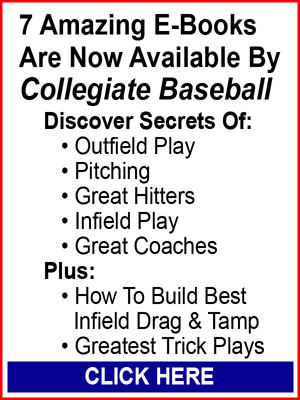 To read more about the epidemic of hit batters in college baseball, purchase the Jan. 23, 2015 edition of Collegiate Baseball by CLICKING HERE. Will Flat Seam Baseball Change College Game? For the first time in 155 years of college baseball, teams will utilize the flat seam baseball during the spring season which is expected to infuse more offense into the game. NCAA Division I, II and III championships will use the flat seam ball in 2015 which means teams in these divisions will use the ball throughout the regular season. The NAIA championship will also use the flat seam ball in 2015 as schools use the ball during the season. NJCAA Division I, II and III championships will use the flat seam ball beginning with the 2016 championship as junior colleges switch to these balls during the 2016 season. Northwest junior colleges (Washington, Oregon, British Columbia) within the Pacific Association Division will use flat seam balls in 2015 while California junior colleges will wait until 2016 to utilize them. Since BBCOR specification bats have been required with the 2011 season, offensive numbers have plummeted in college baseball. The poster child for lack of offense took place at the 2013 and 2014 NCAA Division I College World Series. Only three home runs were hit in 14 games in 2013 while only three were hit in 16 games last June. It marked the lowest home run total since 1966 when only two home runs were hit in 15 games. From an all-time high of 62 homers at the 1998 College World Series, the numbers have sunk lower and lower with 9 in 2011, 10 in 2012 and 3 the last two years. Numbers the last three years have closely mirrored the wood bat era in college baseball which took place up to the 1973 season. The greater the distance a ball travels, the greater the drag effect. The home run should be back in the game but not to the extent where it was several years ago before the BBCOR bat started being used. Craig Keilitz, executive director of the American Baseball Coaches Association, said that he talked to about 50 coaches during the fall who have utilized the flat seam baseball during practices and games. “The majority of those coaches said they saw a difference in the carry compared to the raised seam ball that has been used in college baseball for many years,” said Keilitz. “I am excited to see how the ball performs during the 2015 season with schools that use it and how the numbers wind up, especially home runs. “I would personally like to see more home runs in college baseball. But we don’t need to go back to the extreme number of home runs we had before. Dan Blewett, a former college player who now is the owner of War Bird Training Academy in Normal, Ill., feels a big problem may take place with cold weather early in the season with the flat seam ball for pitchers. “Going to school in Baltimore, this was a ‘southern’ trip for us – one that would escape the frostbitten northern air,” said Blewett. “We lost the first game of my college career 2-1, a 14-inning affair that lasted almost five hours amid snow flurries and chattering teeth. “It was classic February college baseball – cold and windy. “Hundreds of schools tolerate this weather for more than half of their spring season, but it will quickly become less tolerable as they transition to flat seam baseballs. These games were playable as long as the field was dry and free of snow. “What most don’t realize is that these games were made playable in large part because of high-seam baseballs, which will be a thing of the past in 2015. “Most casual onlookers don’t see the big deal – grab the baseball and throw it, right? Not so fast. “The issue of foreign substance use will become rampant in college baseball as college pitchers desperately try to grip a cold, flat, dry ball with cold, dry hands. “As such, what was a minor problem in professional baseball will become a much larger problem in college baseball. “The flat-seam baseball used in the minor leagues is very difficult to grip and throw in temperatures below 40 degrees, especially with wind and dry air. “The Major League ball is even worse. Fortunately for professionals, this is only an issue in April and October, as the bulk of the season is played in the warmth of the summer. 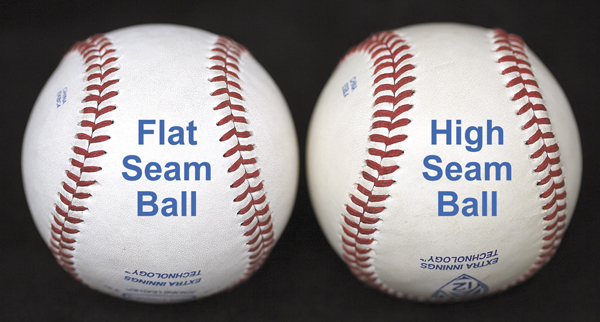 Blewett said there are major differences between the flat seam and high seam balls. “1. Flat seam balls feel rounder. Larger seams protrude from the surface of high seam balls, making the ball feel square by comparison. Flat seams make the ball feel smaller, which can also make them feel less secure in the hand. Large seams can be wedged between fingers on breaking balls, but flat seam balls don’t nest as well. “2. The leather is slicker. Leather on pro baseballs appears to be of higher quality, and it tends to get slicker and shinier the more it hits the mitt. Pro balls become souvenirs after just an at-bat or two, on average, but colleges often retrieve foul balls. This means longer circulation time. Balls that last a few innings are likely to get harder to grip as the game wears on. “3. Pro balls are rubbed up. This makes matters worse, as ‘taking the shine’ off the pearly white ball requires very fine mud to be rubbed on. This fine mud dries into dust. And dusty baseballs are (you guessed it) harder to grip. Though the darkened color may prove a visual advantage, this is a tactile disadvantage to the pitcher. “4. The seams are flat and narrow. Though this is obvious, flat seams mean that more curves and sliders will slip out. The MLB ball has seams that are flatter and narrower than even the minor league ball, which can make the transition to the big leagues more difficult for minor leaguers. Blewett said that because the pro ball is rounder, finger pressure is more often erroneously sent through the descending edges of the ball, resulting in unintended cut and run on fastballs. “Pitchers in the college game will suddenly find their fastballs doing things they’ve never done before, and they’ll be scrambling for answers. But, the issue comes down to pitch slippage, predominantly on breaking balls. “It’s very difficult to ‘feel’ the ball when it’s cold, as both the leather and the skin are cold, dry and slick. “Ask any pro pitcher throwing under these conditions, and he’ll tell you that it affects his confidence in his breaking pitches, because the ball feels insecure in the hand. “Pitchers want to grip and rip their curve or slider, but if they’re afraid it’s going to fly over the batter’s head, they end up choosing pitches based on the ball rather than the count and situation. “This is what we don’t want – for the ball to dictate how the game is played. “What does this mean for college baseball? “Collegiate pitchers will be forced to find comfort with flat seam balls as they throw them in fall and winter workouts, giving them a trial run before the season. “But, part of this learning curve will be finding ways to get their old grip on the new baseball. “The NCAA and other national organizations are likely to have a problem on their hands enforcing a rule against gripping aids, one that they never had to deal with. “Hopefully, players are discrete if they use substances, and the game can go on without interruption, much like pro baseball has. “But, if umpires decide to be strict, there may have to be rule changes. “Players will be throwing in front of scouts in 40-degree weather with flat seam balls. “Rather than hang pitch after pitch and see their draft stock fall, they’re going to find a substance to help them get their old grip back. “Is this cheating? I call it survival. “Both MLB and the NCAA should consider creating a list of approved substances that can be used sparingly to enhance grip. To read more of the in-depth story of this change in baseballs, purchase the Jan. 2, 2015 edition of Collegiate Baseball by CLICKING HERE. Mississippi State pitching coach Butch Thompson explains his thoughts on the subject as well as Chicago Cubs’ Minor League Pitching Coordinator Derek Johnson. 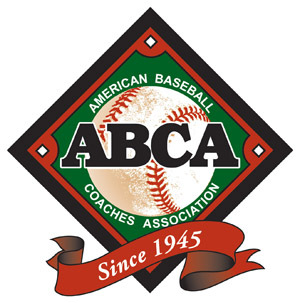 Twelve innovative products at the recent American Baseball Coaches Association convention trade show in Orlando, Fla. were awarded Best of Show certificates by Collegiate Baseball. There were 61 nominations submitted which features the top new baseball products of 2014. Here are the 12 winners chosen by Collegiate Baseball’s Best of Show selection committee with a capsule summary of what each product does. 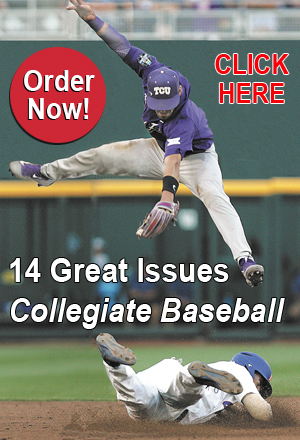 For the complete story which gives in-depth explanations of each product, costs, warranties and contact information, purchase the Jan. 23, 2015 edition of Collegiate Baseball by CLICKING HERE. Professional scouts and college coaches have wrestled for years with the nagging problem of juggling a radar gun, video camera and stopwatch when evaluating prospects. Ra-Vid Technologies has come up with an answer with the Ra-Vid ProSport gun which combines all three of these elements for the first time in history. This firm has teamed with Sony and Stalker to have a unit that records and captures speed as well as register time with a 1/100 second stopwatch all in a 3-pound hand-held unit. SwingTracker is a performance analysis and improvement technology that collects batting swing data at a rate greater than 11,000 data points per second. A special sensor is mounted to the bottom knob of a baseball bat with a strap which temporarily mounts it to that location. The sensor sends signals to a cellphone with the SwingTracker App. As the sensor collects data, virtually any measure about the swing can be obtained. Initially, SwingTracker calculates and reports 11 metrics that are summarized into four core elements of the swing — swing, quickness, power and control. Speed: Maximum hand speed (mph), maximum barrel speed (mph), speed efficiency (percent), forward bat speed (mph). Quickness: Trigger to impact time (milliseconds). Power: Applied power (watts), maximum acceleration (mph/second), impact momentum (kilogram meters per second). Control: Approach angle (degrees), hand cast (inches), distance in the zone (inches). The visualization of the swing is also an important tool to understand and improve. SwingTracker provides a 3D motion view of the swing plane and path to the ball recreated in actual speed, slow and super slow modes. If this wasn’t enough, SwingTracker utilizes a mobile device’s video camera in a unique way. Through a proprietary approach that enhances the device’s video resolution and precisely captures ball impact, SwingTracker synchronizes swing video with the data from the sensor for a complete picture of the swing. Motus has developed break-through movement analysis technology that is changing the way pitchers, coaches, medical and training staff monitor workloads and improve player performance. Already used by nine MLB organizations, the company’s revolutionary mThrow analytics platform will be available to all in February 2015 via a compression sleeve equipped with a Motus-developed wearable device. That device communicates directly to the mThrow mobile app to provide metrics on players’ mechanics and cumulative workloads throughout the season indicating injury risk. A sensor is embedded into the Motus Pitching Sleeve that measures workloads and stress on the ulnar collateral ligament in the elbow of the pitcher along with eight other metrics. They include elbow torque, release point, elbow height, arm slot, wrist speed, elbow speed, arm speed, forearm rotation and maximum shoulder rotation. This unique tee holds the ball from the top which is a vast departure from normal tees that have been on the market for decades. It has been designed to allow batters to hit line drives by changing the batters’ visual perspective of focus to the bottom 2/3 of the ball. Invented by Jarrett Gardner and his younger brother Taylor, the Back-Spin Tee has been a work in progress for over nine months. Recently a study was conducted with the Back-Spin Tee as 30,000 balls were struck from five years olds to professionals. This tee produced a staggering 94 percent line drives, according to the inventors. It is the only tee in the world that has a cone that rotates thereby saving the wear and tear points of contact. A intriguing new product called the Power Drive Performance Sled has been invented by John Miller. It trains baseball players to initiate power from the ground up for pitching, hitting, position throwing and fielding. It is a baseball training aid for developing skills and a conditioning aid for adding strength and is ergonomically designed for baseball. Players will increase performance by learning to use their stronger lower body to produce power and initiate athletic skill movements. Hittinguru 3D is the world’s only markerless (no sensors or pressure plates are used), single camera video system that captures full body motion with 2D and 3D video tracking and training capabilities. The intuitive dashboard provides the user with multiple synchronized views, weight transfer and balance tracking, automated record and replay, on-line lesson sharing, key position learning, multi-user management and much more. 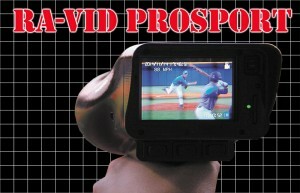 This system offers a 270 degree rotational 3D viewing system to analyze each player’s swing from stance to finish. The system instantly provides over 33 key metrics, including hand path and speed, time to impact and key angles of up to 25 body joints during key stages of the swing. The TAP 360 system utilizes the time-proven TAP (Troutwine Athletic Profile) assessment of athletes’ mental makeup, a patent pending analytics engine and the latest technology to deliver a complete system for evaluating, coaching and developing the mental intangibles relating to athletic performance. A product 40 years in the making has just been developed by Dr. Bill and Ryan Harrison, two of the elite vision performance specialists in baseball. For many years, both of these giants in the industry have tried to teach hitters how to visually learn their unique strike zones. The Pitch Zone Locator and Height Zone Locator are a huge step in this direction which gives coaches and players a method to understand strike zones in three dimensions of a pitch (in and out, up and down and late and early). One of the biggest problems in all of baseball is maximizing the life of gloves. Who hasn’t seen an expensive glove destroyed by neglect or utilizing oil products that weigh the glove down or use a product that causes the glove to deteriorate. The system includes a rigid form that rests on the pocket of the glove to keep a specific shape you want, a protective case and the firm’s proprietary glove conditioner as well as a cleaning rag. There are currently six different designs for the rigid forms that allow the glove to remain at a precise shape which provides the player with consistent feel every time he goes out to practice or play. One of the most annoying problems that coaches endure are defensive players who don’t execute situations properly on the baseball field because of mental mistakes. A solution to this problem has been addressed by a Baseball Academics. This company has developed an App to assist baseball players of all ages to become better fielders by quizzing them on what to do with the ball when it is hit to them based on numerous variables. This App creates a series of plays in a 30-second cycle, and the fielder presses the base that he would throw to. The goal is to do as many plays in the 30-second drill as possible while maintaining the highest possible degree of accuracy. Practicing your skills as a pitcher can become exasperating at times when no catchers are available to throw to for bullpens. This happens all the time to high school pitchers in the fall when catchers are playing other sports or simply refuse to do it because catching is hard on the knees and tough work. A great solution to this nagging problem is the JUGS Backyard Bullpen invented by Dave Candello and Greg Anderson, both longtime JUGS employees. 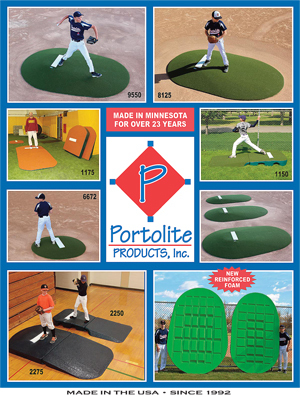 This system, which any pitcher can buy and put in his parents’ backyard, features a strike zone with 12 individual hit-your-spot pockets to isolate specific spots to aim for. It also has a seven foot protective netting surrounding this strike zone which will catch any wild throws by pitchers. The system also includes a JUGS Radar Cube (uses 6 AA batteries that last 8 hours) for velocity readout of pitches and tripod which gives the same accuracy index as the JUGS Radar Gun (plus or minus 1/2 mph). The Radar Cube and tripod are placed in back of the netting. In addition, you receive 15 Perfect Pitch throwing baseballs. These are not simply baseballs. Each ball has a specific count with a pitch you are working on (for example changeup), and a location diagram grid with dots which pinpoints spots you are striving to hit. Pitchers then take the mound and attempt to throw a perfect changeup (or other pitch directed on the ball) to the proper location. After all balls are thrown, the pitcher recovers balls from each pocket to determine his accuracy and what must be worked on. He can write down this information or put it in a computer. If he has a recorder, he can look at the velocity he has thrown after releasing the pitch and verbally give the MPH he threw the pitch and what pitch it was. Then you can track the differentials between fastballs and other pitches as far as miles per hour. In short, the pitcher can do all of this now without anyone being there. This system will help pitchers spot their pitches based on count and speed. Pitchers will be able to work at their skills in practice until it becomes second nature in a game. They will not only isolate the strike zone, but a certain spot in the zone. Dartfish Note will take the use of video and practice performance feedback to new levels. What makes this toolset powerful is the way coaches can quickly review a player’s performance in practice and determine the areas that player needs to work on to improve. Coaches can review any player’s practice video – with performance data. When you find the video that you want to review, for example all fastballs that missed the plate for a particular pitcher, you can download those pitches into the mobile App Dartfish Express and be able to review the video anywhere at any time even if you are not connected to the internet.